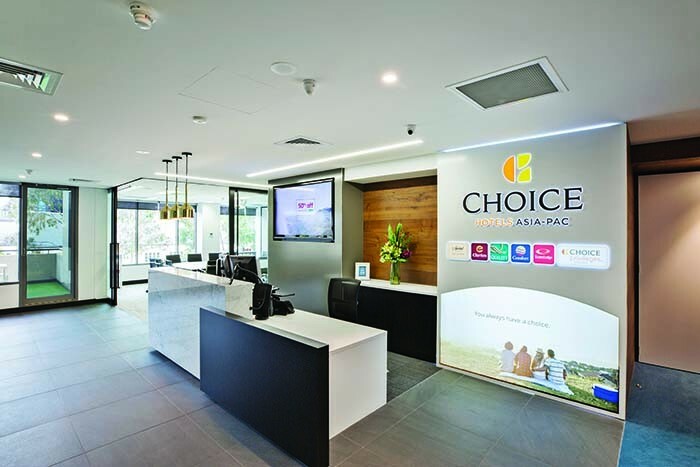 ODC Design recently completed a new workplace office for Choice Hotels located in East Melbourne. The new fitout includes an impressive arrival to the reception area using smooth marble finishes, textured wallpaper, soft fabrics, and timber tongue and groove panels to define each seating option. Separate flexible conference rooms immediately adjacent to the reception entrance open to include an outdoor area, creating one large zone for entertaining. The outside space includes seating and custom joinery with timber cladding designed to incorporate fridges. The back of house area has glass fronted offices arranged at the perimeter which allows for the natural light to filter into the open plan workspaces. The end result was a cohesive and collaborative layout for both clients and staff.